University President Lawrence S. Bacow said the decision to launch an investigation into Harvard’s head fencing coach was part of a University-level conversation about handling the accusations. Peter Brand, Harvard’s head men and women’s fencing coach, sold his Needham, Mass. house to Jie Zhao — the father of current and former members of the team — in 2016 for hundreds of thousands of dollars above its valuation, the Boston Globe reported earlier this month. At the time of the interview, Bacow said he could not recall the name of the firm but that it is one the University has “retained in other capacities.” University spokesperson Jonathan L. Swain declined to provide the name of the firm. Zhao’s younger son, who is currently a sophomore at the College, was admitted to Harvard shortly after the 2016 real estate transaction. He is currently a member of the fencing team. Zhao’s older son graduated from Harvard in 2018 and was also a member of the fencing team. The allegations against Brand and Zhao come in the wake of a nationwide college admissions scandal — which federal authorities dubbed “Operation Varsity Blues” — in which 50 people have been charged for participating in a scheme involving bribing university officials and submitting fraudulent test scores to earn students of wealthy parents seats at elite schools like Yale, Stanford, and Georgetown. Harvard was not implicated in that case. Dean of the Faculty of Arts and Sciences Claudine Gay first announced that Harvard was investigating Brand in an email to FAS affiliates April 4. In the interview Friday, Bacow said coaches were also being “re-trained” in Harvard’s conflict of interest policy following the scandal. 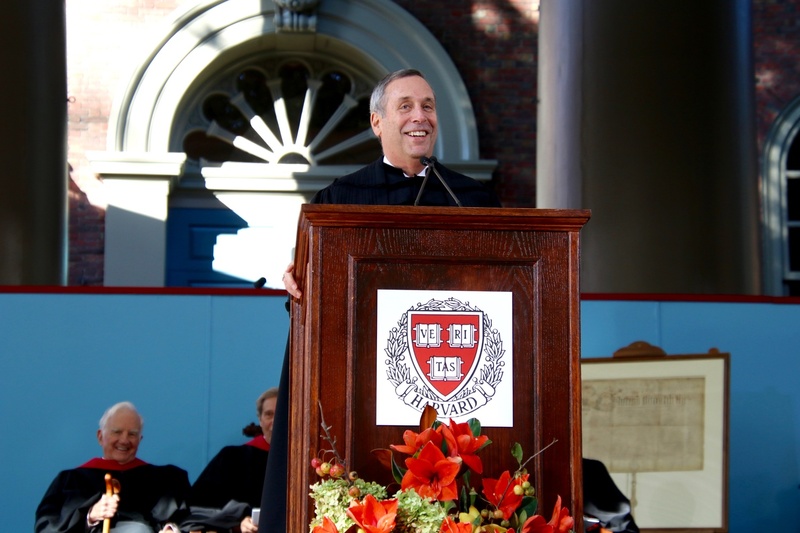 Bacow maintained that the situation was an “opportunity to learn” for Harvard. “It's incumbent upon us to try and not just learn from our own mistakes but learn from other people's mistakes,” Bacow said. In a March interview, Bacow told The Crimson that Harvard does “some things very differently” from some of the schools that were implicated in the nationwide college admissions scandal. On Friday, he reiterated that sentiment, but also said that Harvard is not fully immune to some of the problems uncovered across the country. On Friday, Bacow also restated some of the protocols that Harvard follows in its admissions process, including making decisions in open committee with roughly 40 people voting instead of placing undue weight on individual people’s endorsements for candidates.